I honestly never tried the previous Pista but it's an intermediate oval for sure. My head is about 59cm around and the ML fits me perfect for a race fit. 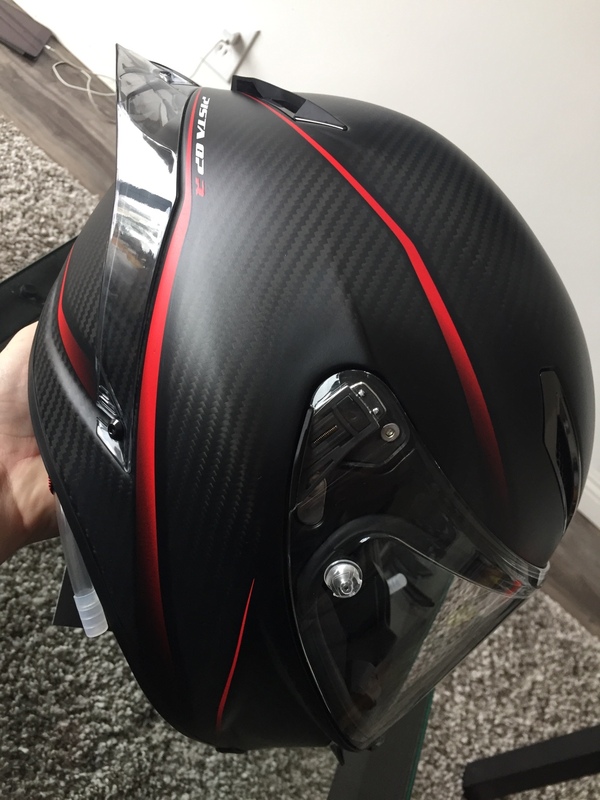 Very similar shape to the nexx xr1r carbon and suomy SR sport I also own. I've never ridden with a hydration system in and I can imagine having that bite valve in your mouth all the time would take some getting used to. Running 5 to ten laps a session I doubt ill need that but I may try it next month and see. Easy to remove and store if you don't use it. Is that an unplugged wire under the lever? Thanks it was a pretty good project. And damn good eye! That is the wire for the stock ohlins electronic suspension that came on the bike. My buddy made a resistor for me to help get rid of the check engine light since I upgraded my suspension. Oh yeah! 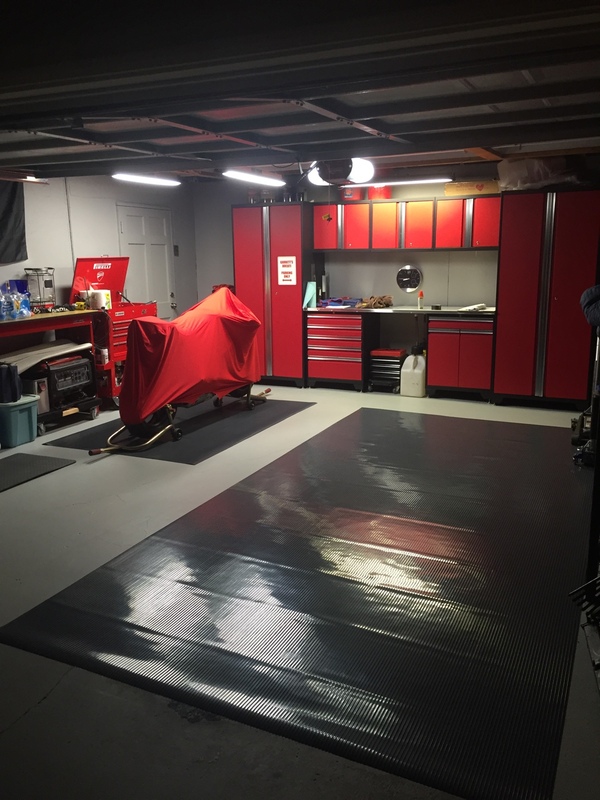 That garage is sick! Good job man! Kudos! 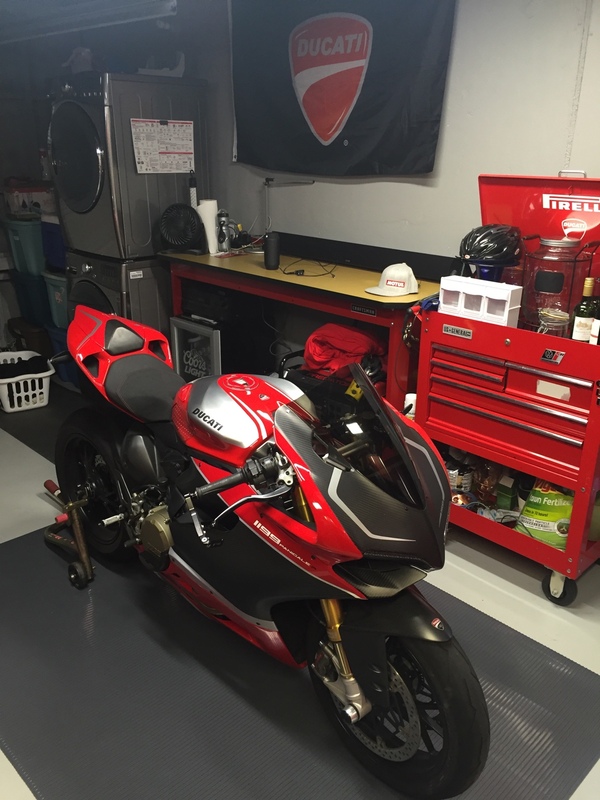 Thought that was the Duc factory lol Sick garage indeed. Let us know how you make out with the visor. 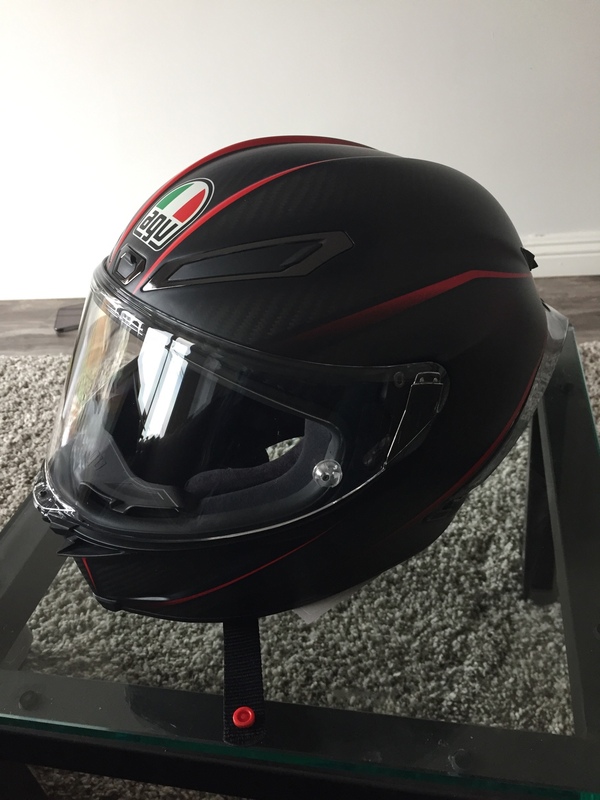 I placed an order last week for the Pista GPR and even they had no idea if the old pista visor would fit or not. I have a brand new gold visor id like to re use if possible but i also know the new GPR's come with a thicker visor so if the new iridiums come thicker it might be worth the cost. 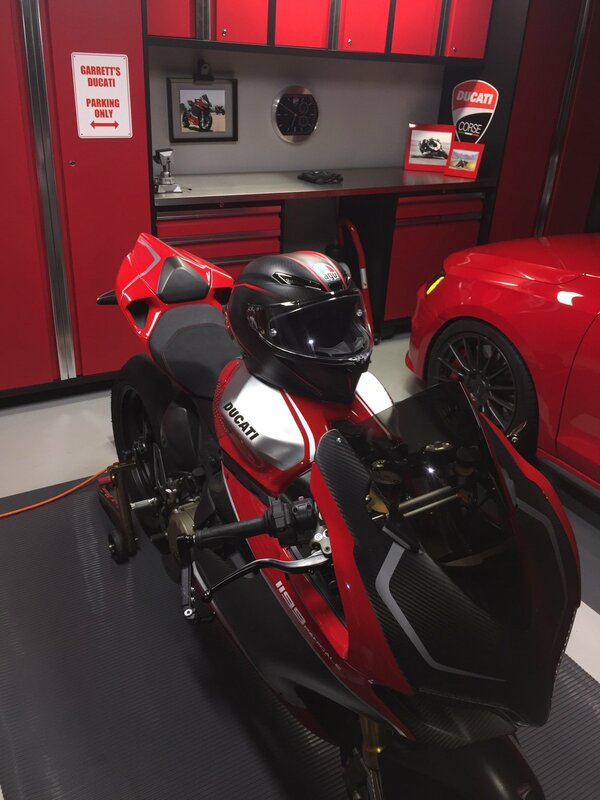 that is one awesome garage, helmet, and R.
Thanks guys. Here's a couple more shots. Just a little single epoxy floor paint from Home Depot, some wall paint to match, Newage pro series cabinets, and some matts I got for the vehicles. Spent about $2500 and it made a huge difference! I'll be test fitting a race 2 visor this weekend so stay tuned. If it doesn't fit I'm wrapping the clear in a dark smoke taillight tint. 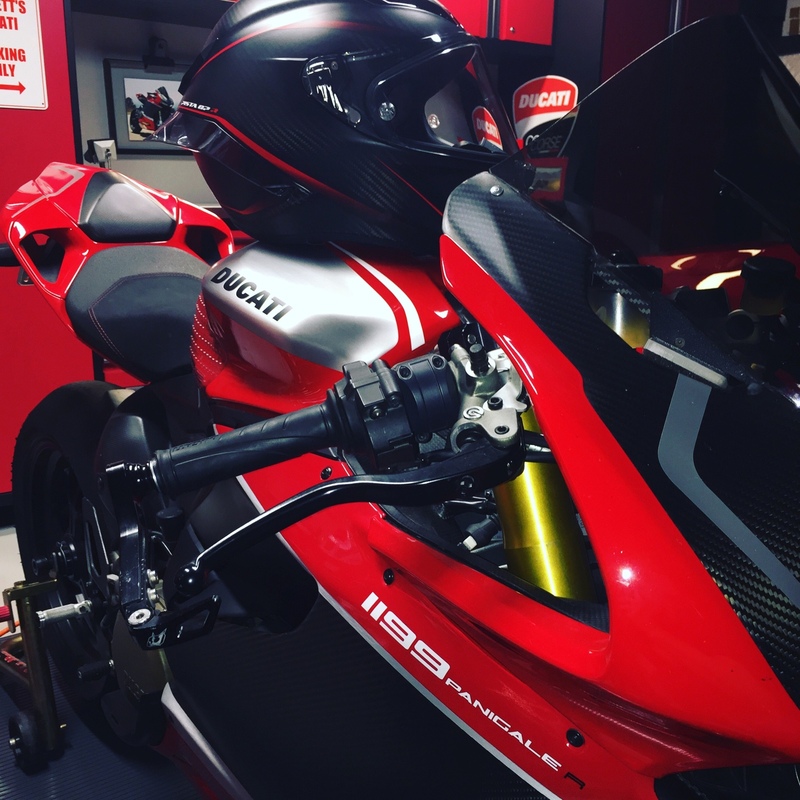 I plan on wearing this for ducati day at chuckwalla valley raceway!! Damn! 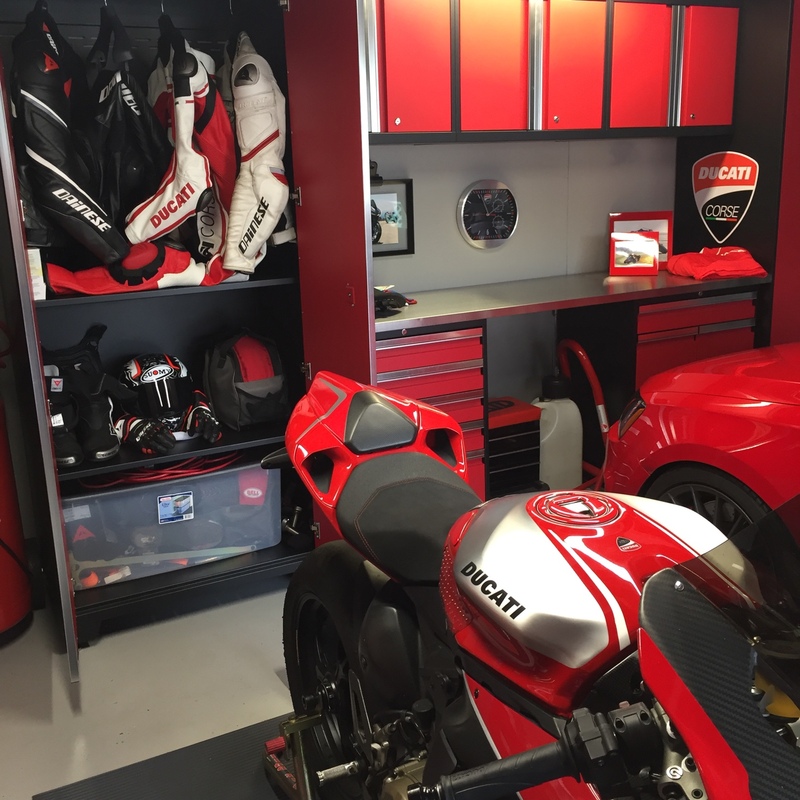 Serious garage Ducati theme envy! Bravo! im not matching gear again ! Next thing you know...Pista RR comes out and you will do all over again.